Click here to jump to the buying advice lower down. If you’re starting out, the usual advice is to buy inexpensive secateurs. Not only are they usually perfectly adequate for pruning bushes and shrubs that have gotten a little wild, but, when you do decide to invest in a pricier pair, you’ll have a spare set. Swiss company Felco makes some of the most widely-known, and perhaps also most widely-respected, pruning tools. What is it with the Swiss and sharp objects? The lifetime-guaranteed Felco 2 is their classic model. It is made from aluminium, features a sap groove to overcome sticking (though that’s not an excuse to stop cleaning), and also has luminous red handles so that they stand out amidst the greenery. For such a good piece of equipment, the price is also very good. There’s a variety of variant models based on this design so, if you like the pruners but they don’t fit into your hand easily, you can always try another pair. 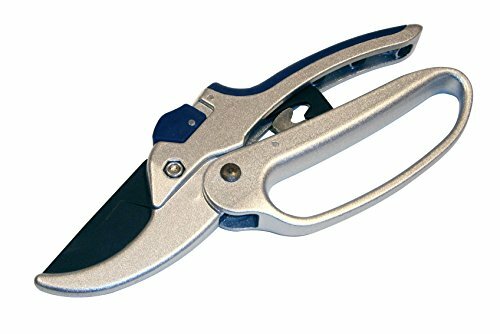 There’s a soft-wire cutter towards the bottom of the blades and the blades themselves can be alignment-adjusted using the bolt at the pruners’ axis. I also found the safety lock to be within easy reach. Finally, I also value the fact that the parts can be easily replaced and that the plastic red handles don’t easily wear off. I tend to avoid products with the kind of plastic handle covering that the Felco 2s have because my experience is that eventually they become loose. Fortunately it’s not a problem I’ve experienced with these. Also worthy of mention is that the spring is non-corrosive. With so many products there’s rust-proof blades that become utterly useless when the spring corrodes away. One final point. On Amazon they’re sometimes listed as having an anvil blade. This is a mistake. These are most certainly bypass secateurs. Spear and Jackson are another big-outfit manufacturer of garden and hand tools. They have a big selection of pruning tools with this one – the “6758GS” anvil model – as a stand-out piece. The main feature of these secateurs that I noticed was their lightness and snug-design (as you can see from the “insert” handle in the picture). Depending on your perspective, this might be a benefit or a hindrance. They’re particularly easy on the hands so are a good option if you have weak wrists or arthritis. Because they’re anvil secateurs they’re suitable for slightly thicker, “woodier” stems and are also coated with PTFE (polytetrafluoroethylene) for resistance to rust and, supposedly, for helping keep the blade sharp. There’s also a type of “gear” feature which allows you to determine the extent to which the blades open, making the process of cutting a tad less strenuous. Spear and Jackson offer a ten-year guarantee which, given the price of this tool, is no small statement of confidence. Finally, I also liked the fact that the main handle was “pure” metal, so no risk of a grip material rubbing off and becoming loose. These are included here because of their high quality relative to the price. Scouring the internet for reviews, there’s a marked absence of negative reviews. For just over ten dollars, you’re not going to get a NASA-developed piece of equipment. But they are functional and fit-for-purpose. They’re the type of first-buy pair that are relegated to the status of “spares” once you decide to spend a little more money. One of my personal favourites! These are smaller secateurs for smaller branches. Their main benefit is their “pocket” size – you pop them into your back pocket and use them for light trimming as you go about other tasks. They’re well-crafted and have a handful of unique features to recommend them. There’s the usual self-cleaning sap-groove and non-slip handles. Everything is steel (apart from the handle coverings) so there’s no fiddly plastic bits that are at risk of coming loose. Very well-made piece and, in my opinion, especially suited to small urban gardens. You can also conveniently buy them in a pack of three if you prefer to have some spares. 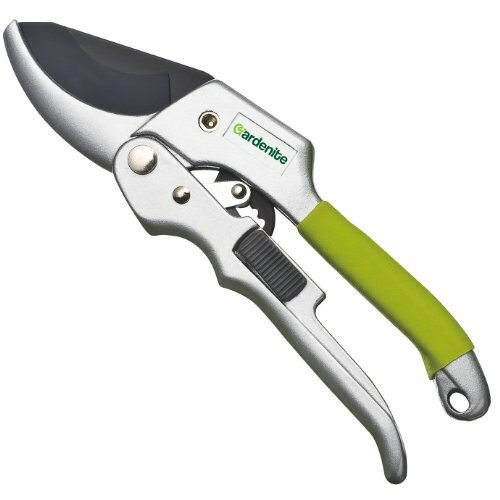 Rachet secateurs are anvil-style pruners that are designed to cut through larger branches. They’re one step down from “loppers”. Their unique feature is the ratchet mechanism which locks the blade mid-cut, allowing you to reapply pressure and so slice through a wider diameter. This offering from Gardenite ticks a lot of boxes for me. The blades are coated in Teflon (I assume the same stuff that’s used on cookware) which helps with sap-related sticking problems and they have a great ergonomic design and all-round “quality” feel. They come with a 1-year warranty and a 100% money-back guarantee. These seem to be only available from US retailers but, if you like them, please don’t be put off! I’ve ordered from from Amazon.com numerous times and, though delivery takes a little longer, I’ve never had any problems. 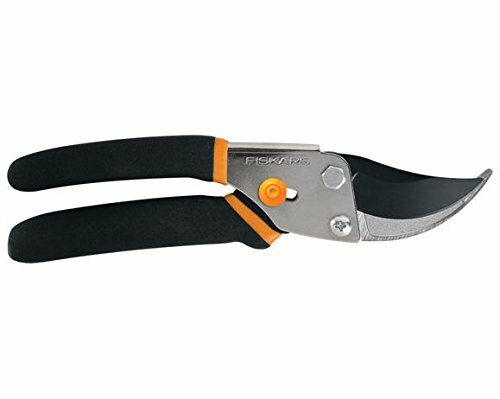 Generally speaking, secateurs or pruning shears are designed to cut through stems and branches no greater than 20mm (3/4in.) thick. For wider branches, you’re likely to need loppers or a pruning saw. Bypass: These pruners mimic the action of a pair of scissors. The cutting mechanism is comprised of two hardened blades that bypass each other. The main benefit is that the cut is cleaner (than anvil-style secateurs) and requires less force. Anvil: Rather than having two scissor-like blades, anvil pruners consist of a single blade and a flat, anvil-like, surface. The result is more of a “crushing” mechanism. The comparative benefit of anvil secateurs is that they can work well when slightly blunt and are able to cut through slightly thicker branches. Hi Zac, thanks! I’ve got about five pairs so there’s no harm in getting a few different types! Tobisho. 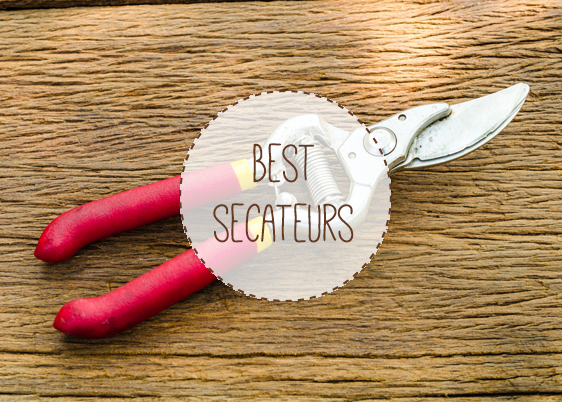 Handmade in Japan and the best secateurs in the world. Ask Monty Don.